NSA offers the following entry-level programs to help employees enhance their skills, improve their understanding of a specific discipline and even cross-train into a new career field. The programs are full-time paid positions. Most are three years long and feature rotational tours throughout the agency. Check out each of the Development Programs below to identify the job titles to search in our application system . CNODP is for highly skilled technical professionals with a background in low level development, computer security, or network security who are interested in developing skills in network, hardware, and software protection and exploitation. Consisting of three independent programs, CNODP's goal is to produce technical Computer Network Operations (CNO) leaders in the areas of CNO defense, exploitation and attack. Program graduates are in high demand throughout the agency. Individuals interested in the CNODP should apply to the Cyber Security Developer- Entry/Mid-Level job ad. The increased complexity of supporting cyber warfare requires world-class researchers and developers. CDP builds the cadre of computer scientists NSA needs to address work across computer science disciplines, including computer network operations, architecture and systems, knowledge discovery, big data processing and information technology infrastructure. Individuals interested in the CDP should apply to the Computer Systems Researcher – Entry/Mid-Level job ad. Diverse academic backgrounds are key to NSA's continued cryptanalytic success. As part of the CADP, all incoming cryptanalysts attend formal classes, receive technical training from experienced cryptanalysts and rotate to various job assignments throughout NSA. No particular major is required; rather, evidence of technical skills and abilities is preferred. Individuals interested in the CADP should apply for an entry-level math position. A firm grasp of mathematics and computer science/engineering skills are combined in the C2DP to address NSA's cryptanalytic and computer network challenges. The C2DP provides classroom and on-the-job training in cryptanalysis, computer network operations, software engineering and high performance computing. Individuals interested in the C2DP should apply to the Cryptanalytic Computer Scientists – Entry/Mid-Level job ad. The Cybersecurity Engineering Development Program (CSEDP) is designed to develop experts in information system security and cryptographic engineering – skill sets essential to protecting U.S. national security systems and keeping pace with complex threats from our adversaries. These two disciplines integrate computer science, engineering, math and information assurance/cybersecurity analysis skills. Individuals interested in the CSEDP should apply to job ads for Software Engineer – Entry to Experienced Level or Information System Security Professional – Entry to Experienced Level . The DSDP provides hands-on learning in operational settings supporting intelligence and cyber analysts. Data scientists are expected to work with analysts to find answers to their questions by applying mathematical reasoning and scripting skills to extract meaning from the agency's large repositories of data. The three-year development program builds an individual data scientist's competency in mathematics/statistics, programming/scripting and analytic reasoning. Individuals interested in the DSDP should apply to the Data Scientist – Entry/Mid-Level job ad. The DDP is a three-year development program that combines rotational assignments, specialized academic training, and in-depth mentorship to develop expertise in the discovery and analysis of digital networks, target infrastructure, and mobile communications. Analysts support the Signals Intelligence (SIGINT) mission by pursuing targets; understanding adversarial tactics, techniques, and methodologies; characterizing networks; discovering new accesses; and exploiting target infrastructure. In addition, DDP provides opportunities to engage leadership, experience diverse tours, attend world class conferences, and travel worldwide on assignment. DDP participants support offices in both the NSA and the United States Cyber Command (USCYBERCOM). Graduates of DDP are aggressively sought for their in-depth knowledge and breadth of experience. Individuals interested in the DDP should apply to the Digital Network Exploitation Analyst – Entry/Mid-Level job ad. The Information Assurance (IA) discipline offers exciting opportunities to defend our nation's information systems and warfighters. The three-year CSODP will provide training and work experience through one of the three different career paths within the IA Mission – Technical, Analytical, and Practitioner areas. Specialized training, focused rotational tours and mission expertise will propel participants into an IA professional career ready to meet the nation's IA needs. Individuals interested in the CSODP should apply to job ads for Computer Network Analyst – Entry to Experienced Level or Information System Security Professional – Entry to Experienced Level. In the ITDP, participants work full-time with world-class technical leaders on rotational operational assignments and lab/classroom training. Participants will gain a depth of knowledge in a breadth of disciplines, including system/security engineering, software engineering, software program management, system architecture and database design. Individuals interested in the ITDP should apply to the Systems Engineer – Entry/Mid-Level job ad. The purpose of IASDP is to develop individuals who can successfully perform the primary tasks associated with intrusion analysis at a proficient level. The IASDP is designed to build upon an individual's existing basic network analysis, computer science and cybersecurity skills by augmenting those skills with intermediate training and organizational tours. This program will train them to a level at which they will successfully perform complex analysis in a variety of organizations, and will be technical leaders in the field of intrusion analysis. Individuals interested in the IASDP should apply to the Computer Network Analyst job ad. Almost all newly-hired NSA mathematicians begin their careers in one of two Math Development Programs: the Cryptologic Mathematician Program (CMP) or the Applied Mathematics Program (AMP). These three-year programs are separately governed but share a common goal: to produce mathematicians who are broadly knowledgeable in the spectrum of mathematical sciences used at NSA. CMP/AMP members study cryptologic mathematics and related subject in NSA-taught classes and go on six-month tours in diverse NSA offices. 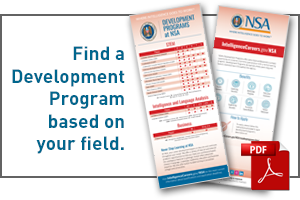 Graduates of the Math Development Programs may choose their first permanent assignments from any of the NSA directorates, depending on availability. Individuals interested in the MDP should apply to the Applied Research Mathematician job ad. The RFDP provides the opportunity for a select group of talented junior engineers and scientists to develop and expand RF skills while contributing to NSA's mission. Each participant will receive an assigned senior mentor and will customize his/her program to capitalize on individual expertise and the needs of the agency. Throughout the program, the selectee will gain hands-on experience while working with senior technical experts in RF design and engineering on mission activities. Individuals interested in the RFDP should apply to the RF Design Engineer – Entry/Mid-Level job ad. NSA signals analysts use the latest in laboratory signal measurement and test equipment, as well as develop hardware and software tools for solving analytic tasks. SADP applies detailed computer science, computer/electrical engineering and mathematics knowledge to train participants to exploit state-of-the art communication systems. Individuals interested in the SADP should apply to the Signals Analyst – Entry/Mid-Level job ad. The SEDP develops junior and mid-level systems engineers to perform as Enterprise Systems Engineers. The SEDP ensures coherent integration of systems engineering-related activities throughout the enterprise; provides a structured, repeatable framework to shape the systems engineering workforce over time; and provides candidates an opportunity for systematic development, career broadening assignments, knowledge, skills and experience. Individuals interested in the SEDP should apply to the Systems Engineer – Entry/Mid-Level job ad. The LADP is designed to build linguistic knowledge for entry-level language analysts and train them in analytic skills and the latest technologies available to the Intelligence Community. Throughout the program they'll work on a wide range of subjects and learn techniques used to evaluate foreign communications. Combined with geopolitical and cultural expertise, they will use these skills to understand both overtly stated meaning and subtly implied intent as they translate and transcribe foreign communications, and report critical information to U.S. government customers. Individuals interested in the LADP should apply to the Multidisciplined Language Analyst – Entry/Mid-Level job ad. This development program is designed to help entry-level intelligence analysts achieve a full spectrum of work role skills. As a part of the IADP, you'll solve difficult technical problems, gather knowledge of targets' communication environments and technologies, and provide assessments of target intentions unavailable from other intelligence disciplines. Individuals interested in the IADP should apply to the Intelligence Analyst – Entry Level job ad. The BFMDP prepares individuals to manage the agency's planning, programming, budgeting and execution activities. The program provides structured professional development for those hired into the agency as business financial managers. Participants will engage in all phases of the IC, DoD and NSA/CSS financial processes: program build, financial plan execution, and accounting and reporting. Individuals interested in the BFMDP should apply to the Contracting/Finance – Entry Level job ad. The CODP prepares those new to the contracting career field by providing opportunities to participate in all phases of the acquisition process, from planning to contract award and administration. Participants will gain a broad understanding of contracting and the acquisition process; what it entails, how it is carried out, and how it interacts with and impacts the rest of the agency. Individuals interested in the CODP should apply to the Contracting/Finance – Entry Level job ad. The CMDP prepares individuals to successfully participate in, and eventually manage, all facets of contract management. Participants will gain a solid working knowledge of numerous business tasks, including, but not limited to, serving as the primary contracting officer representative developing budget estimates and monitoring resource requirements to support the implementation of strategic plans. Individuals interested in the CMDP should apply to the Contracting/Finance – Entry Level job ad. The PMDP attracts technically educated individuals who can successfully participate in, and eventually lead, current and future DoD integrated acquisition, technology and logistics activities. Participants will partner closely with mission customers to research, develop and draft capability requirements, create acquisition program documents, and develop and manage acquisition program schedules and budget estimates to support the implementation of strategic plans. They will act as liaison between the technical and business functions and personnel of their assigned program. Individuals interested in the PMDP should apply to the Program Manager – Entry Level job ad.